With all the responsibility of being the keeper of coveted treasures off her shoulder and memories of a first love forgotten, Qing Shuo is now an entirely blank slate. She may have lost her memories, but seems like she lost a bit of her mind as well. 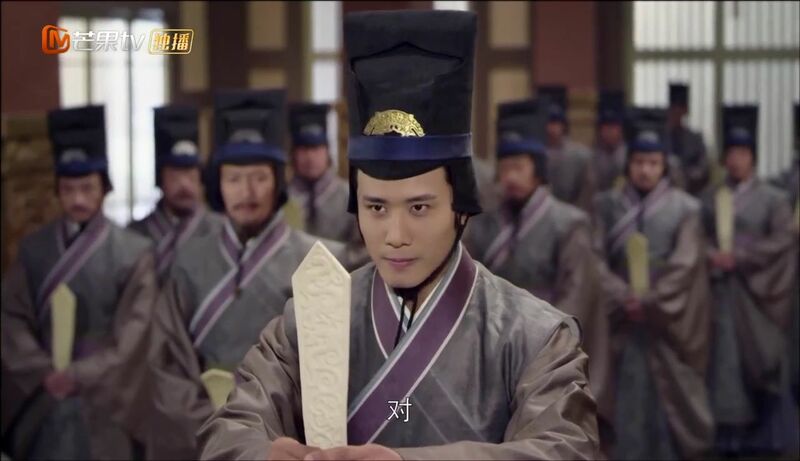 Wen Yong is shown the bottle of blood found with the dead men, something his righthand man Chu Lin Xi (Zhang Xiao Qian) has hidden from Yu Wen Hu and the Emperor’s men. Now, if Qing Shuo is really conspiring with the assassins, it is hard to explain why the assassins didn’t just hide in the bridal chamber. That alone does not mean her innocence, since she is from Yu Wen Hu’s family after all. But they have no leads now, since the assassins are supposedly very clean, and must wait for Qing Shuo to wake up. At the Northern Qi-Zhou border, Zhou soldiers are surprised to find the place completely empty. 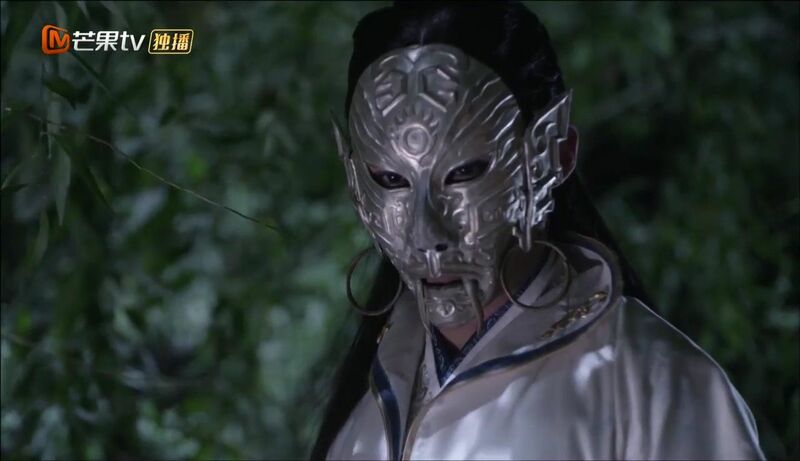 They belatedly notice Chang Gong, in his famously fearsome mask, perched on a tree. He may be alone, but easily defeats all the men. His men come running and all the villagers show up, bloodthirsty for Zhou soldiers’ death. 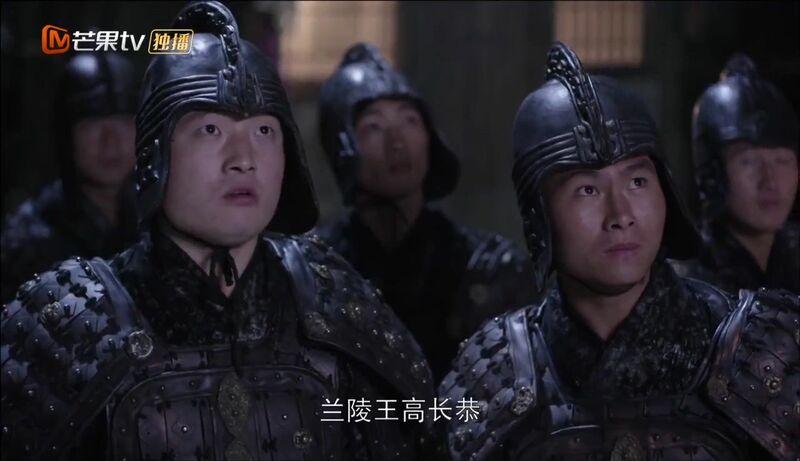 The soldiers plead for mercy, and Chang Gong reminds them that this is Qi’s territory, his territory. He orders his men to take care of the soldiers and the villagers bow their heads to thank the prince. A messenger comes running with news that please Chang Gong: the assassination attempt at Wen Yong’s mansion has caused political and social disability in Zhou, providing them a wonderful opportunity to invade the country. He orders his men to prepare for battle immediately. Qing Shuo finally wakes, surprised to find Wen Yong by her bedside. He tells her to explain herself, while she just looks confused. Her head pains her and he tells her to cut the act. She is shocked to hear she married into Wen Yong’s mansion and demands to know who he is. Wait, this is an amnesia drama? Of course Wen Yong doesn’t buy it and demands her intentions for marrying him. She tries to escape but again he manhandles her, while she screams for help. She pleads that she really doesn’t know anything and that she doesn’t remember anything. He takes out her treasured handkerchief, but post-amnesia Qing Shuo just yells to be let go. He then tears it up, hoping for a reaction, but of course he doesn’t get any. Alone in her room, Qing Shuo finally gets some time to sort out her thoughts: who is the man earlier and why is he so mean to her? More importantly, who is she? Why is she here? The more she thinks, the more her head hurts. Madam Shao is here to visit her niece. 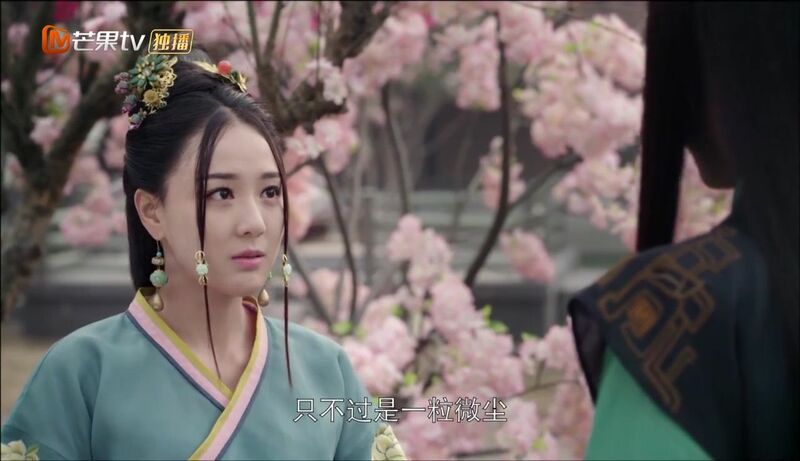 Surprised to hear about the amnesia, she tries to jog Qing Shuo’s memory but of course it doesn’t work. Not even the Emperor’s physicians have the miracle cure for Qing Shuo’s amnesia. 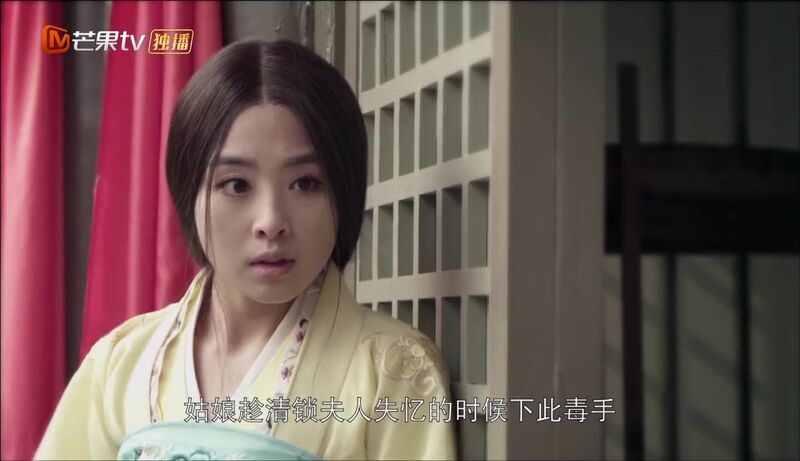 She wants to take Qing Shuo home but Wen Yong, wanting to get to bottom of events, stops her. He promises to take care of her but Qing Shuo basically tells him to shove it and readily agrees to go with her aunt. 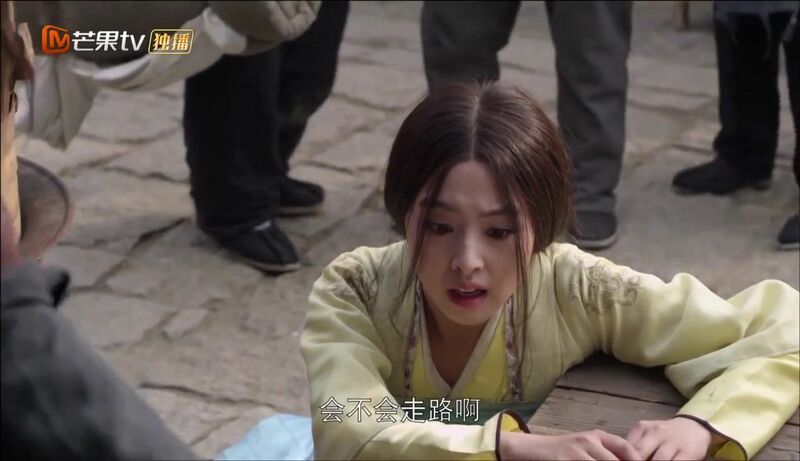 This is when Yang Yan Wan (Hua Jiao) bursts in, calling Qing Shuo little sister. 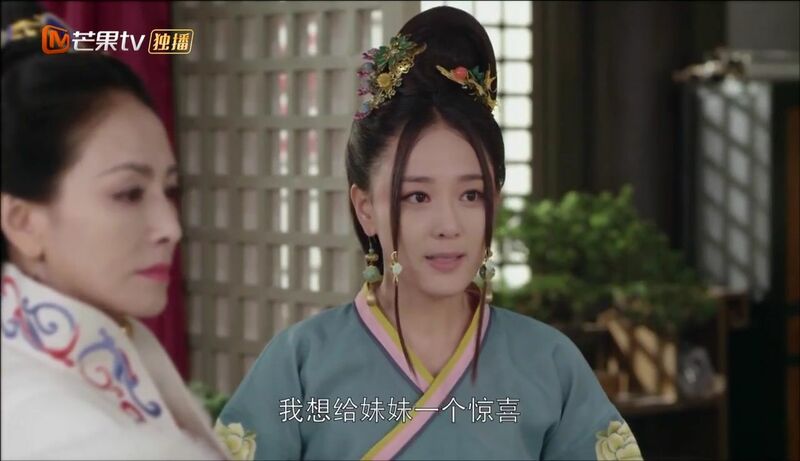 She admonishes Qing Shuo for not leaving any face for Wen Yong, how unlike the little sister she knows. When Madam Shao asks her to be the moderator, she says it is improper for the bride to return to her maternal home the day after her wedding. 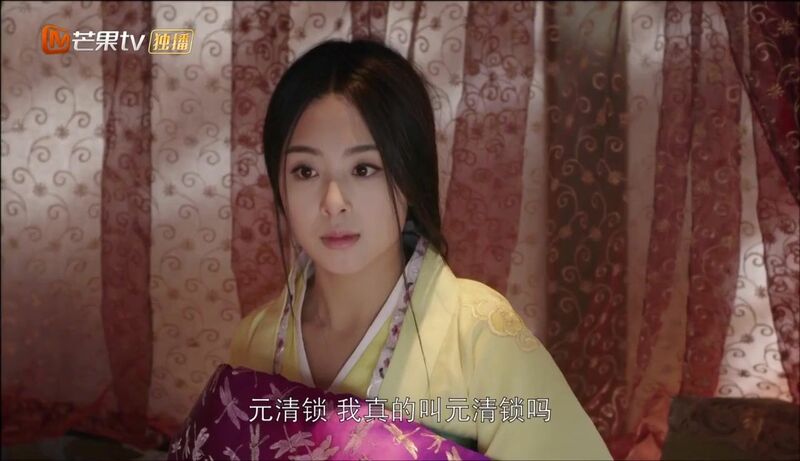 Yan Wan recalls how she first met Qing Shuo two months ago, when Madam Shao first brought her to Chang’an. Since they already became sisters then, she doesn’t mind staying here to stay here to accompany Qing Shuo. When she asks for Qing Shuo’s opinion, she just faints in response, lol. 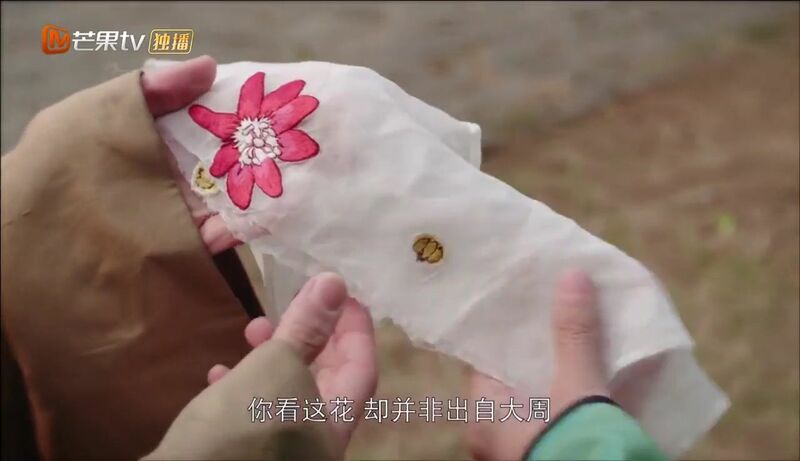 Wen Yong analyses the handkerchief: there is nothing strange about the fireflies motif, but the red flower is not native to Zhou. Lin Xi thinks the flowers are from Qi, locally known as Jie You (lit. to ease worries) flower. But it is a little different than what Wen Yong remembers, during his time in Qi as a hostage. Lin Xi thinks it is still reason for suspicion, since people often take creative license with their embroidery. They end their conversation, though, when they see Yan Wan approaching. 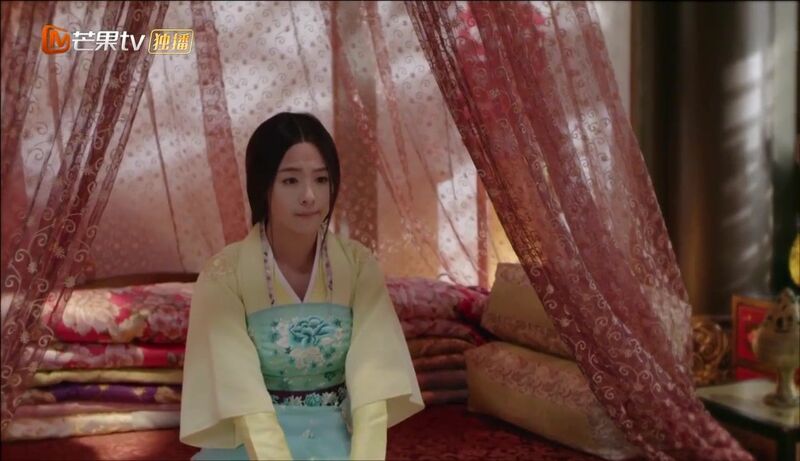 She informs Wen Yong that she has successfully sent Madam Shao away, leaving no doubt that she did this for him. She takes fault with Wen Yong calling her Ms Yang (notably calling him Ah Yong), after all they grew up together. She makes him call her Wan-er. She is clearly in love with Wen Yong, but laments that she is so insignificant to him that he didn’t even send her a wedding invitation. He worries about her making the long journey but she doesn’t mind as long as she gets to be with Wen Yong and Qing Shuo. This is so weird, because I think she means it. Taking advantage of the girl’s clear infatuation with him, Wen Yong asks for a favour. We don’t get to hear what it is, but from his cunning smirk, it probably isn’t anything good for our heroine. Qing Shuo is still having an existential crisis, questioning everything she knows and doesn’t know about herself. Yan Wan arrives, and tells her she will prepare dinner herself. Maybe she will remember then. She then oh so casually brings up the fact that she thinks the position of Wen Yong’s concubine will be hers, but then quickly adds that as long as their hearts (as sisters) are one, everything is fine. How is Qing Shuo not alarmed by this is beyond me. The maid brings Qing Shuo out for a walk and leaves to bring her a coat. She wanders towards the kitchen, where Yan Wan is cooking. Her maid notices Qing Shuo arriving and then they put on a show of poisoning the soup. 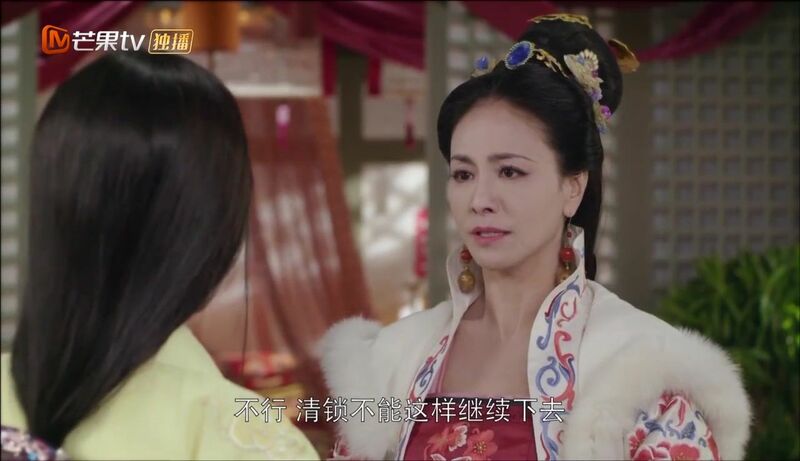 For Qing Shuo’s benefit, Yan Wan pulls out an entire evil-queen monologue: if she drops dead, Yan Wan can become the concubine and Wen Yong doesn’t really want her anyway, etc. She even brings up the handkerchief with the flower from Qi. I feel like she means every word, even if it is just a show. This of course spooks Qing Shuo so much that her first thought is to run away. By nightfall, she has the entire mansion looking for her. But she is smart enough to hide first. She remembers what Yan Wan said about the handkerchief, and decides that maybe going to Qi will help her recover her memories. 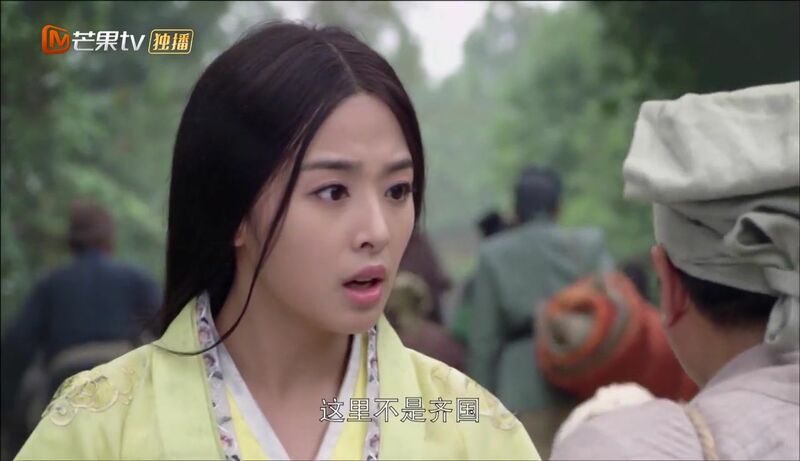 Lin Xi arrives with news that Qing Shuo has left the city as soon as the gate opens, heading towards Qi. He wonders if she really is associated with Qi, but Wen Yong says he will wait for her to explain herself. He also tells Lin Xi to spread the rumour that Zhen Hun pearl is indeed in his mansion but disappeared along with Qing Shuo. Damn. 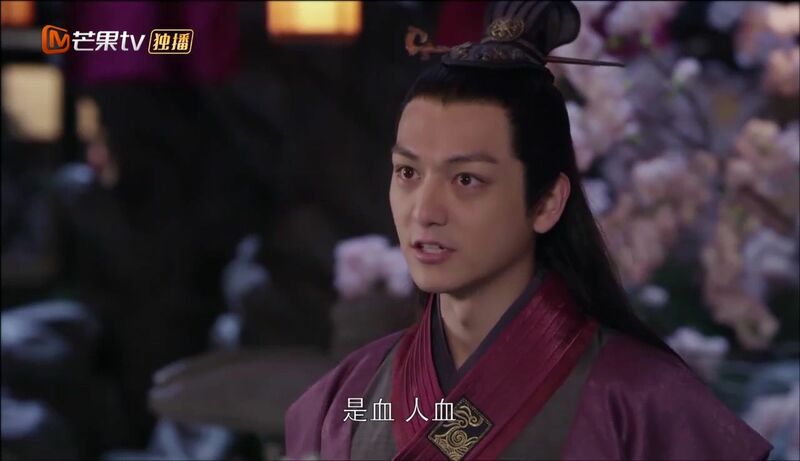 His man worries that with such rumours, Qing Shuo will be in immense danger, but Wen Yong just says Qing Shuo is smart enough to protect herself. Instead, he wants the puppet masters behind her to reveal themselves. A messenger then arrives with news that the Emperor has summoned him. The Emperor excitedly explains that he found a good recipe to combat memory loss. 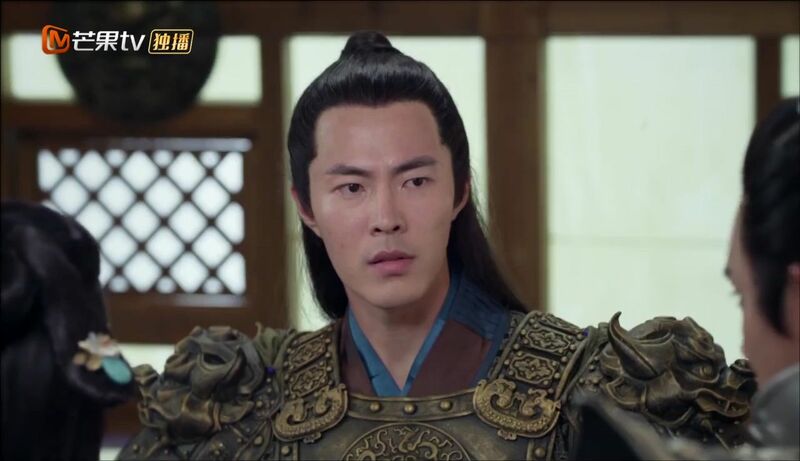 Wen Yong has to break the news that Qing Shuo has escaped, but all the Emperor is concerned about her safety. He knows that Qing Shuo can’t be innocent in all this, but he pities her for being involved in all the political machinations. Wen Yong notes this, of course. Seems like the Emperor is sinking deeper into his longing for Qing Shuo. But there is no time to dwell on sentiments because news have come that Chang Gong has invaded one of their cities. 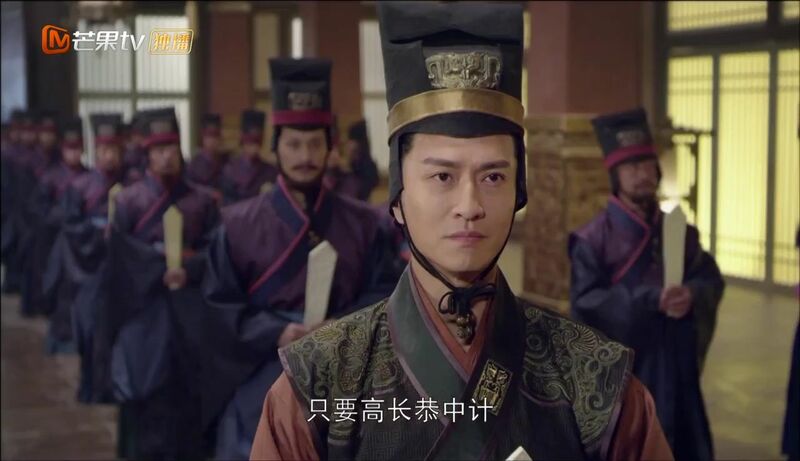 The Emperor asks for opinions in court, and one of Wen Yong’s faction says it is best to punish Qi severely for such an offence. Yu Wen Hu’s faction instead suggests a reconcilliation, after all too many of their people have suffered. The two factions bicker, until the Emperor decides on retailiation after all. While everyone loudly calls for Qi’s defeat, no one offers to take charge, until Wen Yong steps up. 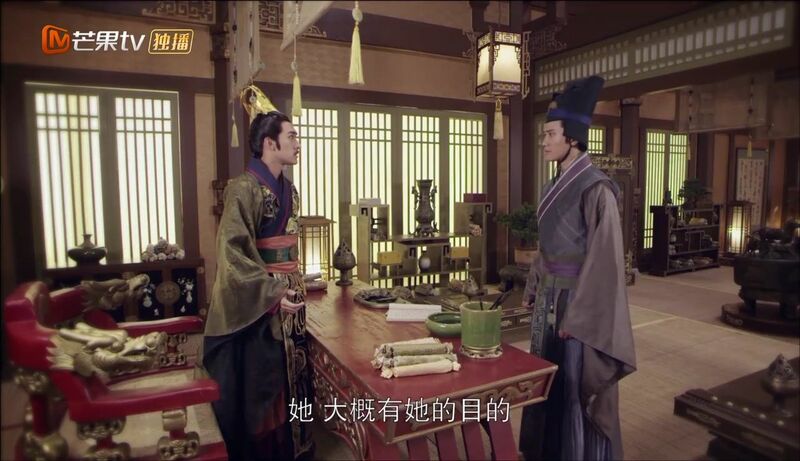 It surprises the Emperor, but pleases him when Wen Yong promises to do well. However, Yu Wen Hu argues that for all his theoretical knowledge about war, Wen Yong is still inexperienced. He offers to go himself instead, and that is that. The runaway Qing Shuo admonishes herself for not bringing anything when the road to Qi is still long. From afar, a mysterious man and his servant watches her. The servant wonders if they should help her. The mysterious man says that with the rumours out, everyone will be watching Qing Shuo. The servant thinks if they can just take Qing Shuo back to Kunming, everything will be resolved. He asks his master if he is worries about conflicting with The Four Bodyguards. Curious and curioser. Who are these people? Mystery man just says it is a waiting game for now, with everyone wanting Zhen Hun pearl. In fact, he actually worries about Qing Shuo as she is heading straight into the warzone. But it looks like they are not alone in tailing her. Qi and Zhou armies face off in the warzone, with ten of thousands of men from both sides. 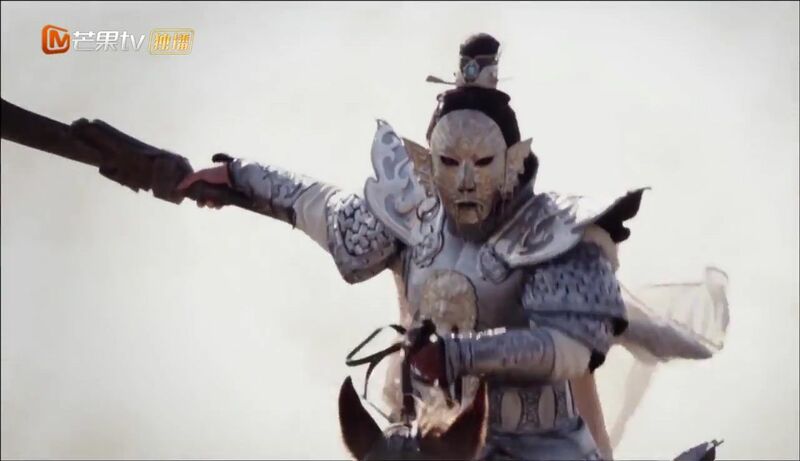 Chang Gong charge into his enemies ahead of his soldiers, looking every bit like the god of war. 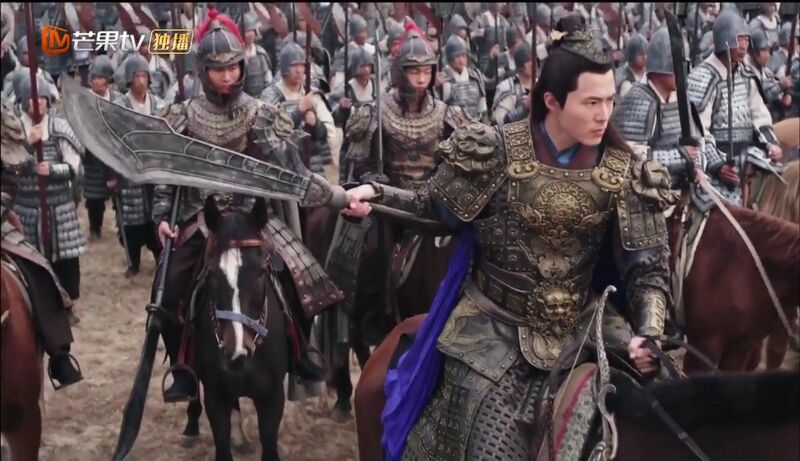 His righthand man Ye Lu Guang (Zhang Zi Wen) orders the release of the arrows and the rain of arrows down a significant amount of the Zhou army. With an invincible Chang Gong at the helm of a spirited army, they eventually force the Zhou army into retreat. 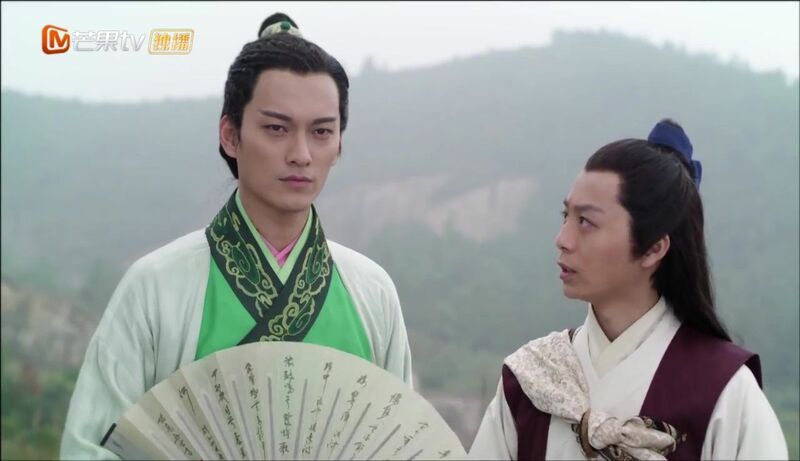 Lu Guang wants to follow, but Chang Gong stops him, worried that it could be a trap. 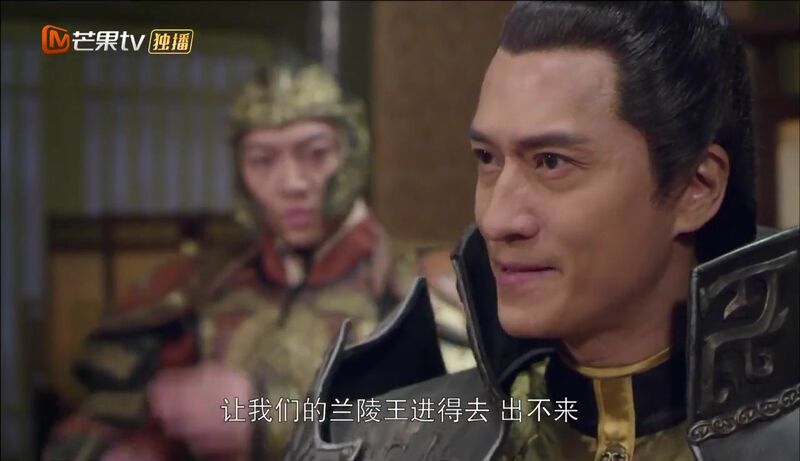 Lu Guang is unhappy about it, but Chang Gong just says that there will be future opportunities to annihilate Yu Wen Hu. 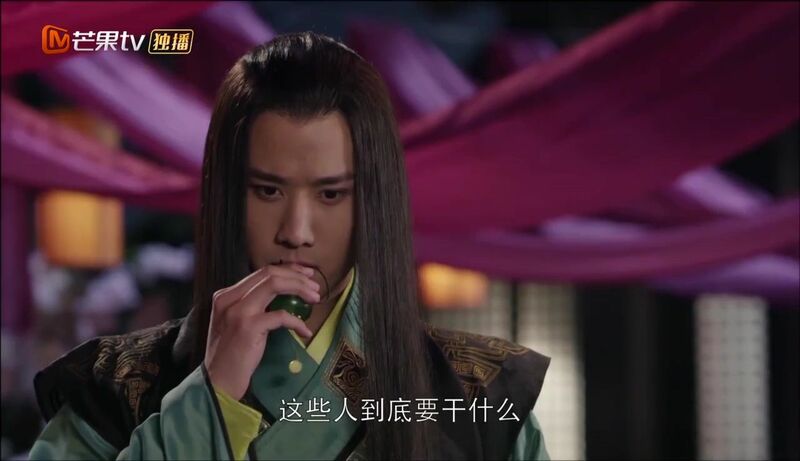 Qing Shuo finally enters a village and practically salivates watching a kid eat his drumstick. While watching a baozi seller, she trips over nothing and knocks all the baozi down. She is unable to pay, but she offers to compensate with labour. When she balks at the amount of work he wants her to do (including cleaning his house), the seller tries to drag her to see the police instead. The same lady who has been tailing Qing Shuo interrupts, offering to pay for the seller’s loss in her place. The rest of the baozi can go also go to Qing Shuo, she can eat as many as she wants. 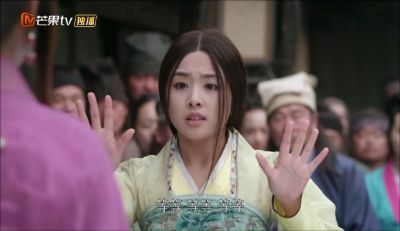 The lady kindly encourages Qing Shuo to eat, but just when she is about to take a bite, someone forces the baozi out of her hands. 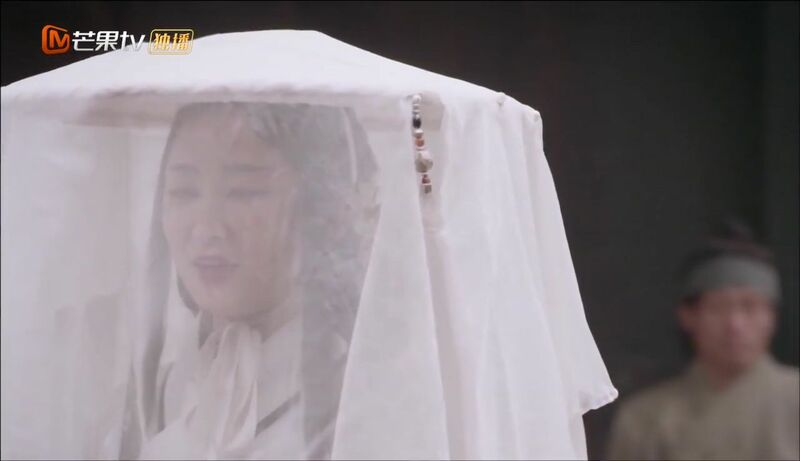 A veiled lady interrupts, saying it is unethical for her to poison the baozi: “If your Wu Chen gege finds out about this, how can you explain yourself?” The lady, called Tao Hua, defends herself. She wants to prove her innocence by consuming the baozi, but the veiled lady says it doesn’t matter since she has the antidote. 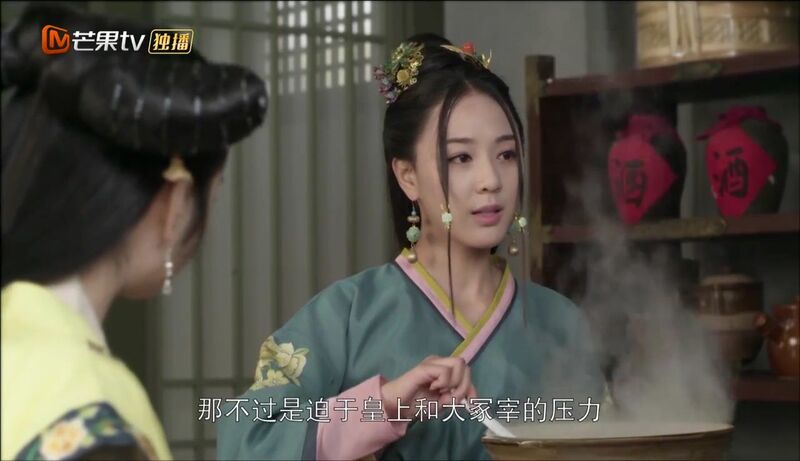 Miao Wu Yian, the veiled lady, says she shouldn’t try to bribe Qing Shuo with just some baozi. Miao Wu Yian says with her around, Tao Hua can forget about her dirty tricks. 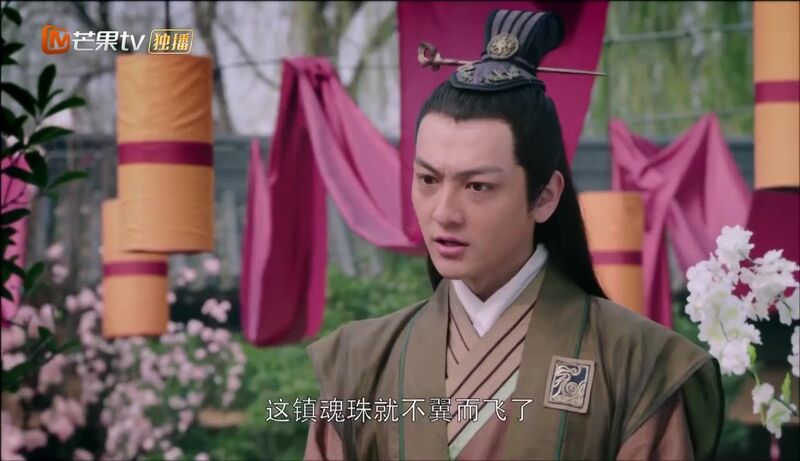 Qing Shuo looks just as confused as I feel right now and demands an explanation. She optimistically asks if they know who she is. Of course now the two ladies now fight over who is good, and who Qing Shuo should follow. The verbal spar turns into a literal one, and the peanut gallery flees, so does Qing Shuo. Hah, smart girl. 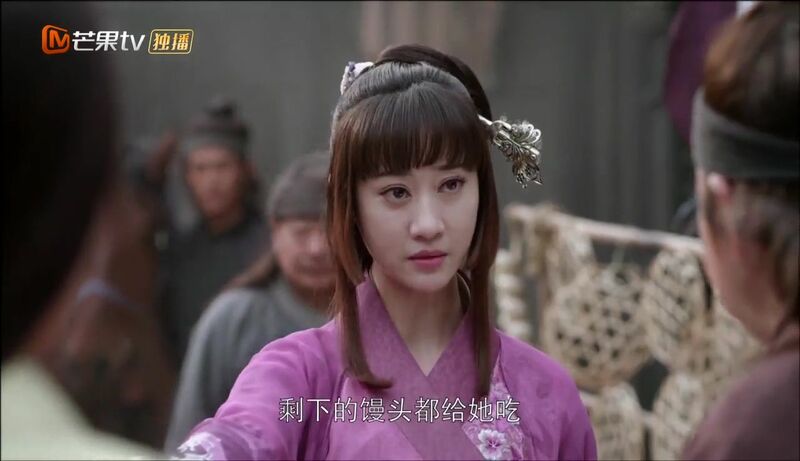 Miao Wu Yian is definitely the trickier of the two, because now that Qing Shuo is not around, she stops fighting. No one is there to see the show anyway. She reminds Tao Hua that whether it is stealing a man, or a woman for that matter, she is far superior. 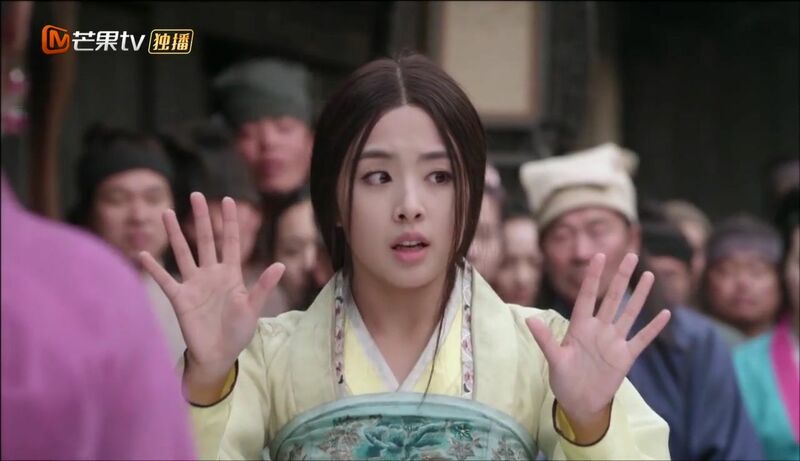 Meanwhile, Qing Shuo finally makes it out of the village and when she hears that she is moving towards Hu San City, the Northern Qi-Zhou border, she just excitedly runs ahead. Never mind that the uncle is yelling that there is war ahead. 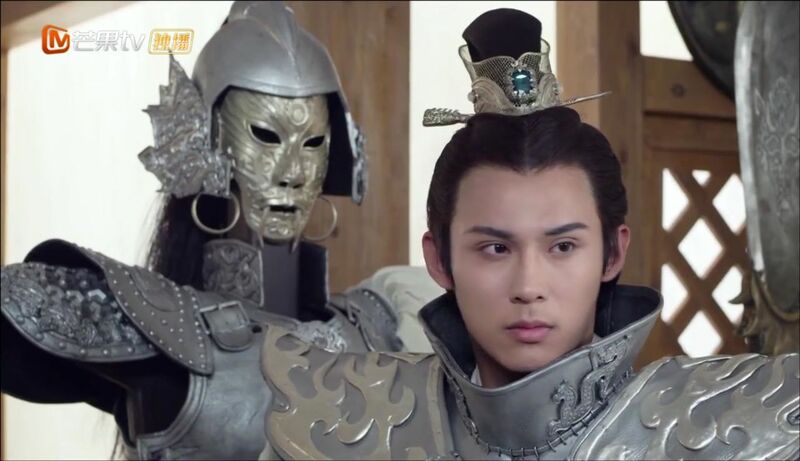 Chang Gong knows Yu Wen Hu is up to no good and orders Lu Guang to strengthen their forces. 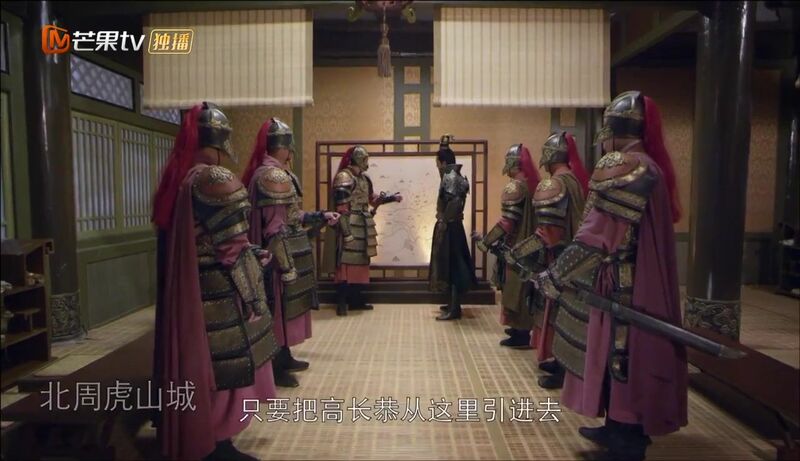 This is when Zheng Luo Yun (Wang Jie Xi) shows up, trying to help him off his armour. A surprised Chang Gong admonishes Li Guang for bringing a woman, but he retorts that Chang Gong has never thought of Luo Yun as a woman. Luo Yun agrees to leave, but Lu Guang stops her. She is the fiancee of the Prince of Lan Ling and his cousin (they are from the powerful Yelu tribe) after all. 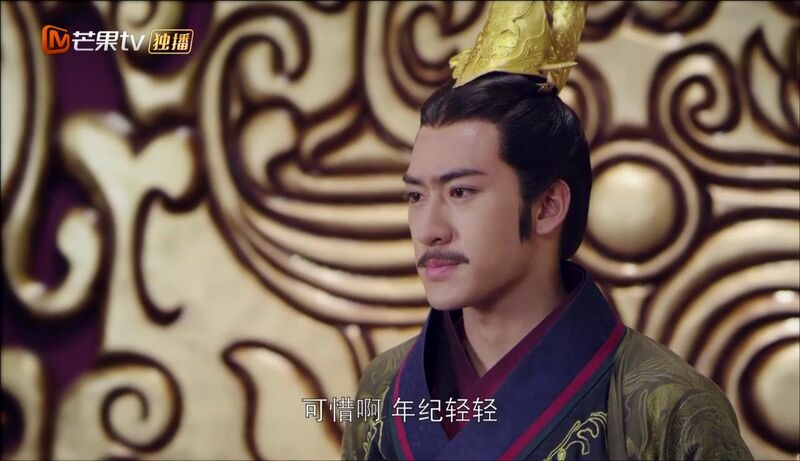 Chang Gong finally agrees to let her stay until their victory but he really doesn’t look all too pleased with it. Back at the Zhou camp, Yu Wen Hu’s people are strategising to entrap Chang Gong. Indeed, their plan has failed earlier when he didn’t follow. Yu Wen Hu thinks that the only reason he didn’t follow is because there isn’t anything worth following. He obviously has something up his sleeve for Chang Gong. Ryu: I certainly didn’t expect amnesia, but suppose it is easy way to produce enough angst to rival HQG. At least the amnesia serves as a plausible reason why Qing Shuo would ever fall for someone else, when she is shown to be so much in love with Chang Gong. There won’t be a show otherwise, because first loves are immortal, amirite? And if we ever think Qing Shuo is fickle, we can also blame the amnesia. Truly the most versatile trope. There are so many new people, so many names, so many confusing allegiances in this episode, my head is spinning. One thing is clear though: they either want Qing Shuo so they can get to the pearl or they want Qing Shuo out of the way so they can get the people who wants the pearl. 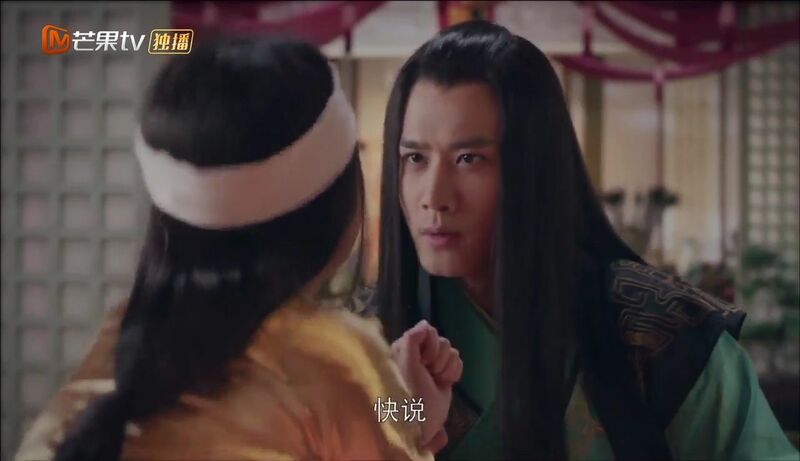 I still don’t understand Qing Shuo’s logic of running away to an entirely new, hostile country just because a flower embroidery, at least she is running straight into Chang Gong’s arms (yes, I hear you, I am going down with this ship anyway). 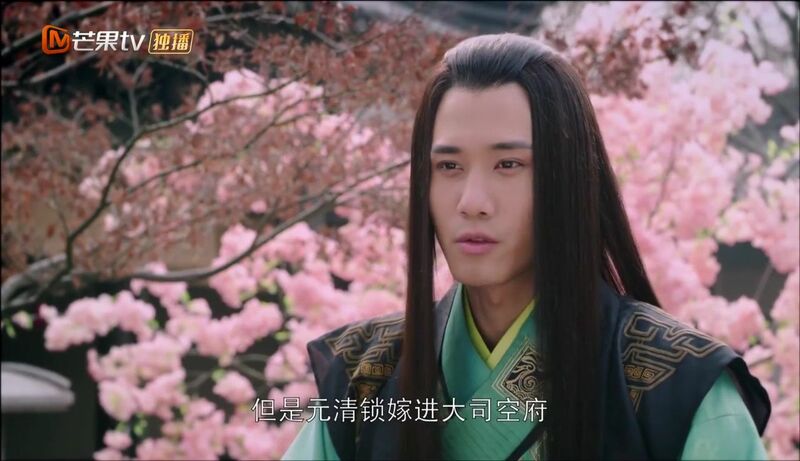 This entry was posted in Recaps & Other Thoughts and tagged Andy Chen, Cdrama, Edward Zhang Xiao Chen, Gilbert Lam, Hua Jiao, Kris Shen, Kristy Zhang Han Yun, Lily Tien, Liu Shuai Liang, Novel Adaptations, Peng Guan Ying, Princess of Lan Ling, Steven Zhang Xin Cheng, Theresa Fu, Wang Jie Xi by Ryu. Bookmark the permalink. Thank you again for the recap Ryu! Love your titles btw. 🙂 I was also surprised they played the amnesia card for this but I guess there wouldn’t be another way for her to give both guys a chance since she’s in love with Chang Gong. But I think she went to Qi bc no would tell her who she really is and staying in the manor wasn’t exactly safe since she was getting poisoned and no one was nice to her. So she wanted to take matters in her own hands? At least that’s the logic I think she has, but she didn’t do a good job planning lol. I think my problem with Qing Shuo’s logic is that she doesn’t even consider running to the one family she knows. Considering how desperate she is to find out who she is, wouldn’t an actual living, breathing person like her aunt would provide better answers rather than a completely abstract clue like a handkerchief embroidery? If we’re at least shown that she thinks no one in Zhou is trustworthy, then I can better accept her running straight into a hostile country. Off Topic: Did anyone watch L.O.R.D.? Before watching I had low expectations but it was actually really great! hohohoho!!! of all things i didn’t expect an amnesia plot!! it’s my least favorite trope so i need a few moments to churn that down. [email protected] a bit of her mind. thanks ryu! indeed so many characters. I hope they don’t drag the anemsia for too long but I think they will ? tho. Enjoying both the OTP ships at the moment and Andy is perfect for Lan Ling Wang not joking he is prettier than adorable Kristy. The drama could be a little more fluid but it’s definitely really pretty. Hopefully viki will get it licensed to get English subs. Oh trust me, the amnesia will be dragged long enough until Qing Shuo has the opportunity to fall for Wen Yong. That’s how you milk drama. And I agree with you! I think Andy’s casting is spot on, he looks pretty yet not delicate enough to be completely unbelievable as a god of war. Andy casting is spot on and I can’t believe how he is not getting roles with his face. I don’t think he acting is bad either I hope he gets bigger roles in the future. 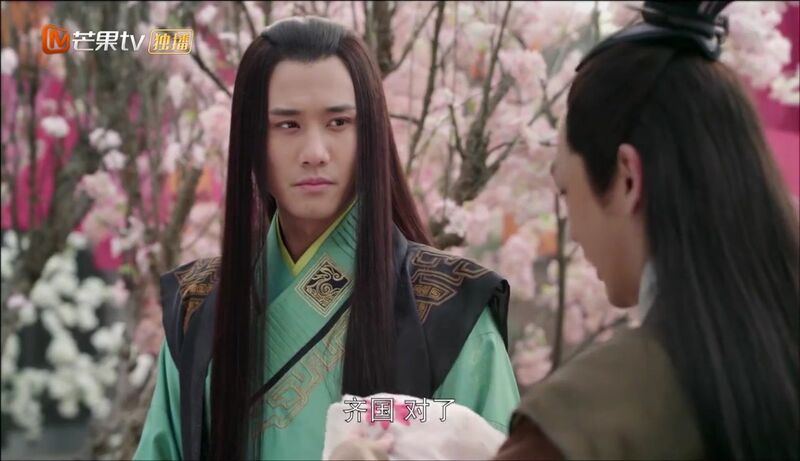 I couldn’t even watch the Ariel version of Lan Ling Wang just because Feng Shao Feng didn’t match the role for me I mean he is a good actor but as the most beautiful man in Chinese history you got to be joking. Thanks for the recap, please keep it up. I might look into this drama more if it seems to get more interesting soon.